CALGARY - Alberta's political leaders are entering the second week of the election campaign aiming to attract a huge block of undecided voters. There have been a number of polls come out during the first week of the Alberta election campaign so far and although the results may differ, the one thing they all have in common is the high percentage of undecided voters. That's a major change on the Alberta political scene where traditionally a huge Conservative majority is inevitable. 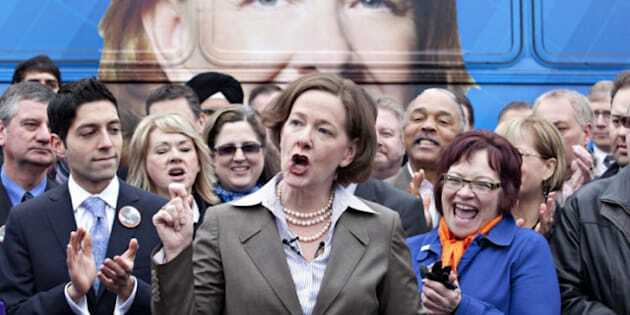 "I think there's a lot of people that are undecided and what I find interesting about that is they're prepared to say they're undecided which tells me that they're quite engaged," said Premier Alison Redford, at a campaign stop in Calgary Sunday. "They're just not sure who they want to vote for and that's a good thing because I think that is a change in the electorate. Four years ago we had only 40 per cent turnout at the polls and I think we're going to see a higher turnout this time," she said. "People are thinking about what their options are. They're thinking about what they want the future to be and they are genuinely considering what their choices are." University of Lethbridge political scientist Peter McCormick says this is an election campaign like no other in Alberta because the outcome isn't preordained. "Obviously in Alberta nobody can remember a time Conservatives weren't running the provincial government," said McCormick. "It's who do you want to run the province going forward. Who best reflects the interests of Alberta as you understand it." Danielle Smith, the leader of the rival Wildrose party, said Albertans have a chance to finally make a difference this election and hopes her message will reach those who are undecided. "It is an historic election. We have four very competitive political parties. There's a lot of ideas on the table, a lot to discuss. We want to choose a direction for our province and I hope we can all get to looking at the issues," said Smith. Smith will spend the early part of the week in Fort McMurray and Grande Prairie and promises a number of new announcements. Redford said she will unveil new policies on health care and seniors. The level of undecided voters has some political pundits speculating that the Alberta Liberal party could see its base further erode with some shifting to the New Democrats while others fearing a Wildrose win would move over to Redford's Tories. Liberal leader Raj Sherman doesn't expect that to be the case. He said the vote splitting between Conservative and Wildrose voters should be an advantage for the Liberals. "We're glad that they're (Wildrose) there," Sherman said. "We're going to capitalize on the vote splits and our internal polling shows that we're going to contest in a lot of ridings we previously didn't have a chance in because the Wildrose is going to steal half the conservative vote and I see the Liberals picking up a lot of seats in the election."